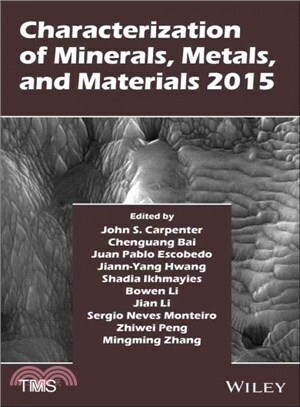 This collection of proceedings focuses on the characterization of minerals, metals, and materials as well as the application of characterization results on the processing of these materials. Papers cover topics such as clays, ceramics, composites, ferrous metals, non-ferrous metals, minerals, electronic materials, magnetic materials, environmental materials, advanced materials, and soft materials.? In addition, papers covering materials extraction, materials processing, corrosion, welding, solidification, and method development are included.?? This book provides a current snapshot of characterization in materials science and its role in validating, informing, and driving current theories in the field of materials science.? This proceedings volume will serve the dual purpose of furnishing a broad introduction of the field to novices while simultaneously serving to keep subject matter experts up-to-date. John S. Carpenter, Los Alamos National Laboratory. J. Pablo Escobedo-Diaz, University of New South Wales. Jiann-Yang Hwang, Michigan Technological University. Shadia J. Ikhmayies, Al Isra University. Bowen Li, Michigan Technological University. Sergio Neves Monteiro, Military Institute of Engineering. Zhiwei Peng, Michigan Technological University.